Shop Smart, The M-Commerce take over! As we are an office of various smart phones, we find the recent statistics on smart phone usage incredible! The use of Smart phones is set to take over the desktop PC by the end of next year. 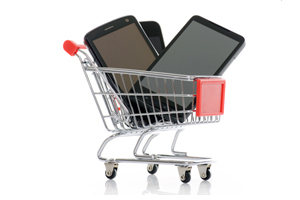 20% of smart phone users are now buying things using their handsets. 47% of I-phone users are buying things with their phones, followed closely by Blackberry users and other smart phones like Android. The extensive choice of easy to use apps has made spending money easy. The speed and convenience of mobile browsing has meant that many companies are adapting their websites to ensure they are mobile friendly, therefore increasing their appeal to shoppers on the go. Last year there was an average spend of £76.69 per month per smart phone user on groceries alone, with travel tickets coming close at £56.26. These figures are set to increase by 132% and 217% respectively in the next 12 months! Can we assume that this new generation of shoppers leaves our supermarkets empty, making trolley rage in the aisles and long checkout queues a thing of the past?